Featuring John Herbst, US ambassador to Ukraine 2003-06. The tragic loss of life in Ukraine has shocked, saddened and angered the world. With uncertainty still gripping the nation and tensions running high, the situation remains fragile. Will Ukraine emerge from the bloodshed a budding democracy, or will the situation spiral out of control into a full-blown civil war? Oksana Boyko: Hello and welcome to Worlds Apart. Ukraine literally means a country lying on the edge, and while this mainly refers to geography, it is also a pretty accurate description of its the current political situation. Where is Ukraine heading? To discuss that, I am now joined by John Herbst, the former US ambassador to the country. Ambassador Herbst, thank you very much for talking to us. OB: Now, Russia and the United States, perhaps not surprisingly, differ a great deal in how they characterise the events unfolding in Ukraine. For Russia, it’s a coup d’etat, for the Unites States it’s a democratic uprising or a democratic revolution, and the images that are being broadcast from Kiev are also strikingly different. The Russians see swastikas being painted all over central Kiev and armed men, men in balaclavas storming government buildings, while I think many Americans are being shown those inspired faces of protesters who are living and breathing democracy. Why do you think the contrast is so stark? JH: First of all, there are not many swastikas being painted in Kiev, except perhaps by ‘Titushki’ who are paid-for allies of the government that is not no longer in power, Mr Yanukovych’s government. OB: That’s not exactly true, because our reporters are on the ground in Kiev, and actually you can see swastikas all over central Kiev. I mean we don’t know who actually is behind that but the sheer number is pretty staggering. JH: There’s an old point of analysis which says ‘cui bono’ - who benefits. The only people who benefited by swastikas are those who try to discredit the protesters. So the idea that the protesters are busy putting up symbols of Hitler, I think, is preposterous. OB: What about armed man in balaclavas, because they, we know for a fact that they’re behind the siege of government buildings, and by now government institutions, city halls have being taken over by protesters in a lot of Ukrainian municipalities. What about them? JH: Well that’s true this has happened, it is also true that this is the reaction to four years of oppressive government by Mr Yanukovych. Mr Yanukovych was the beneficiary of Mr Yushchenko’s democratic aspirations. So Yanukovych won a free and fair election in 2010 and unfortunately, since that time as President he’s put increasing authoritarian strictures on the opposition. OB: So that led the opposition to take up arms to continue with, to enforce their democratic aspirations? JH: You’re mischaracterising the situation when you say they took up arms. The point is that Mr Yanukovych, and this is why he is no longer in power, he authorised the use of live force, including snipers, as form of crowd control against largely unarmed protesters. This is a crime. JH: That would be a lie. OB: …but I think that one thing we can agree upon that the situation is very, very complex in Ukraine. JH: Yes, it is certainly complex. OB: Yes and the key psychological difference between the West and Russia, I would argue, is that the West, as usual, hopes for the best and Russia, as usual, fears the worst. Probably there are democratically inspired protesters and I think we can also agree, there are some radical forces. The question is, of course, what is the sheer percentage of each of the group and what I would like to ask you is: if Russia is proven wrong and this, you know, revolution, this uprising is all about democracy, then I guess we will all benefit. But what if the West is proven wrong and those ultra-nationalist anti-Semitic forces prevail? Would that be to the detriment of all the parties involved? JH: Have you ever heard of George Orwell? JH: Yes, George Orwell said totalitarian politics are characterised by the use of smear words like ‘anti-Semitic’ and extreme ultra-nationalist. We have not seen actions of an ultra-nationalist kind, or for that matter of an anti-Semitic kind among the protesters. OB: Well, nobody knows but it was attacked. JH: That’s right, exactly, nobody knows, maybe it was ‘Titushki’. Who burnt down the Reichstag? So yes it is quite possible these were provocateurs. OB: Well, I mean, you can argue about who actually did that, but one thing for sure is that that in many of these municipalities protesters are now in control, so they are calling the shots. If a synagogue was attacked once they arrived in power, then maybe they have something to do with that. JH: I think you’re stretching. You are stretching for a reason to tar the protesters. That’s unfortunate. OB: Maybe I am indeed stretching but I would like to draw one historic parallel. Ukraine had pretty strong, used to have pretty strong, ties with Libya under the Gaddafi regime. Many Ukrainian nurses, Ukrainian doctors, used to work there. And I remember when the events were unfolding, the Western narrative was pretty much the same, that it was a genuine democratic uprising. Sure there were some radical forces within the opposition but once Gaddafi is ousted, those militia will lay down arms, they will no longer be part of conventional politics, and that obviously didn’t happen. How can you be sure that those, some of those radicals, some of those ultra-nationalist forces won’t prevail in this quagmire? JH: The situation in Libya is very different from the situation in Ukraine. We knew and we understood, even as Gaddafi was in power, that there were extremists in Libya. You are right that some, that there was a hope that when Gaddafi left, what would follow would be something beneficial, something democratic, and that has not happened. But in Ukraine, the situation is vastly different. We are not worried about Islamic extremists in Ukraine. We are not really worried about nationalist extremists in Ukraine. If you look carefully, there has been nothing incendiary said by the Pravy Sektor leaders, nothing incendiary said by Mr Tyagnibok since Euro Maidan appeared, although there are quotes from Mr Tyagnibok from years ago which are incendiary. We’ve seen close to model rhetoric coming from people in the Maidan. OB: But people who have been producing that close-to-model rhetoric, they’ve been taking over government buildings, they’ve been taking over city halls. I wonder how that would be perceived in the United States, if Occupy Wall Street protesters were to take over a city hall in Washington DC. How would that be perceived? Would that still be labelled as a peaceful protest? JH: That would be labelled as disorderly behaviour. But let’s understand something, something which I haven’t heard you acknowledge. And that is that the policies of Mr Yanukovych were authoritarian. They were repressive and it’s natural that people will respond forcefully against authoritarian and repressive policies. People were finally fed up with those restrictions, as well as, of course, with the massive corruption. So, I am not justifying the seizure of buildings, I am just explaining to you the circumstances in which it happened. OB: Well, you seem to be condoning some of the tactics employed by the protesters. I would even agree with you that Yanukovych wasn’t the most efficient Ukrainian president ever, even though that country is yet to see a very effective leadership - let’s put it that way - but I wonder what’s the point of endangering the Ukraine’s nascent democratic system by siding with protesters so unequivocally, as the United States has been doing? Because, you know, you can blame all things on Yanukovych but one would think that democracy is more precious and democratic institutions, democratic procedures should be valued higher than ousting an unpleasant or even a dictatorial leader from power, especially when you have elections coming at the end of next year. JH: The United States has also suggested that the protesters should demonstrate restraint, and I agree with that. They certainly did things which we perhaps would not have advised them to do. But if you contrast their behaviour with the behaviour of the Berkuts, as ordered by Yanukovych, the one side was brutal, slaughtering scores of people. The other side were seizing buildings. There’s no comparison. Now, you talk about the presidential elections which were scheduled for 2015. We all knew that Mr Yanukovych was preparing to steal that election, the same way he tried to steal the elections in 2004 when I was in Kiev. Mr Yanukovych was going to make sure that the most popular politician at large was in jail. Mr Klitcshcko cannot run in the presidential elections in 2015, and I’m yet to hear anyone in Russia complain. OB: Well, Ambassador you don’t have a crystal ball. JH: Yes correct, I don’t have a crystal ball. I do have political analysis and historical analysis. And if you look at that historical analysis you see Mr Yanukovych tried to steal elections ten years ago. It would not be surprising if he tried to steal elections in 2015. OB: Well, Ambassador using your logic, taking your logic, it would mean that we should have pre-emptive protests any time there’s any suspicion of manipulation of the elections. I think democracy works the other way around. You first wait for the results, you see whether the person, whoever is elected, and then you protest. But you seem to be suggesting that you should intervene beforehand. And in fact, I think this is what we actually saw on the ground with the American officials, and I would like to ask you about something that you wrote fairly recently. JH: I didn’t say that at all. What I suggested was your claim, that all the protesters have to do is to wait for the 2015 elections, was false based upon Yanukovych’s record, first in 2004 and then since 2010. Now, let’s talk about the initial protest in Ukraine. Let’s talks about the “American role” in those protests. OB: Can I actually put to you a question, because in one of your recent op-eds, you called Washington’s approach sensible. You denied that the United States was meddling in Ukrainian affairs, and that’s despite the fact that the State Department’s Assistant Secretary of State for European Affairs, Ms. Nuland, appeared on Independence Square with a bag of cookies for the protesters, but I think you can take it as, you know, just a difference in diplomatic culture. What I would like to ask you though, if that doesn’t count as meddling, how would you feel about Russia’s Foreign Minister Sergey Lavrov appearing at one of the American protests relies, let’s say the Occupy Wall Street rally, and handing out caviar and vodka to the protesters. How would that be perceived? JH: Well, I think you’re having trouble understanding that you had a repressive government in Ukraine. There’s not a repressive government in Washington. OB: Well, I think a lot of people can take issue with that. JH: Well, wait a minute. You asked me a question. Well, some people take an issue of it, and the people who take issue of it are people who represent authoritarian regimes. Your problem perhaps is that you are newscaster in a country which is authoritarian, and therefore you don’t want to see a democratic country on your doorstep, a democratic country in Ukraine. JH: I understand why you have to say you live in a democratic country. Soviet journalists also had to say that. And we knew it’s not true then, and we know it‘s not true now. But regarding the United States and the demonstrations in Ukraine, Victoria Nuland showed up and handed out some cookies. She was expressing support for the free right to demonstrate. That’s it. JH: She was expressing support for peaceful protest. Now contrast the American actions with the Russian action. A very important official in Russia, Mr Glazyev,called for the use of force to clear the square. Mr Yanukovcih used force. Mr Glazyev was encouraging Mr Yanukovych to murder his own citizens. OB: Well Ambassador, I heard you make that point before, but Mr Glazyev is a really, well let’s say insignificant figure in Russian politics. He doesn’t hold a public office; he is not even a member of Parliament. He is a former politician with very little weight in Russia's political circles. But Ambassador Herbst, we have to take a very short break now. I hope we will come back to this discussion, and what we are going to discuss is how much of the geopolitical manoeuvring in Ukraine is about Ukraine and how much of it is about Russia. That’s coming up in a few moments on Worlds Apart. 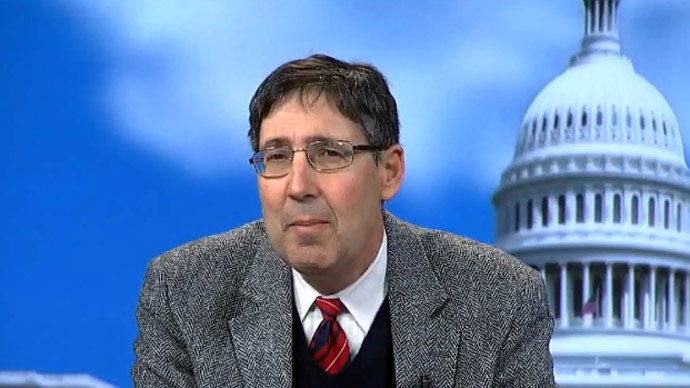 OB: Welcome back to Worlds Apart where we are discussing the events in Ukraine with John Herbst, a former US ambassador to the country. Ambassador Herbst, you mentioned earlier that my comparison of Ukraine to Libya was inappropriate, maybe bit of an overstretch, but I think we can definitely compare events in Ukraine to what was happening there a decade ago in 2004, when you were the US ambassador to that country. And in one of your public appearances, you reflected on the change of government at that time. Let’s listen to what you had to say. JH: I remember telling my staff at the Embassy when Yuschenko won, that this was an important milestone, but this really was not a victory of the good guys over the bad guys. Because I said, the same sort of people who make up the party that lost are in the party that won. OB: Ambassador, I think that's a very astute observation. I think it is even a bit too straight forward for an American diplomat. Do you still believe that, you know, the party that lost is pretty similar to the party that won. JH: I think that there are similarities amongst the elite in all political parties in Ukraine. There is a large number of oligarchs who care mainly about their own wealth. I also think, though, that there was one important difference 10 years ago. I think that in the parties that make up the opposition, you know, we're talking about the Batkivshchyna party, we're talking about Udar, they are leaders who really are committed to an open society and democracy. Mr, Yuschenko certainly was, he had other flaws. It’s pretty clear that in the Party of Regions there is not such a commitment to democracy. That’s why you had all the problems of the past three months. There is one other point too, that is very interesting. The demonstrators on the Maidan understand what I said - that there are oligarchs in all parties. And that’s one of the reason why they did not simply accept the points of view expressed, and the positions taken, by the leaders of the opposition party. Even Yulia Timsochenko, who was and is an oligarch, was booed by some protesters on the Maidan when she spoke there after she was released from jail. So this is a new phenomenon that we need to watch. I can't say I understand it. But you expressed the fear that the people on the Maidan were radicals. There maybe some there, we don’t really know, but it is also true they maybe insisting on a more honest political culture in Ukraine. OB: They maybe insisting on a more honest political culture in Ukraine - who wouldn’t for that matter - but I think what people in Ukraine really want is some effective leadership. They want their life to get better and as we all know, the economic situation in Ukraine is pretty desperate at this point of time. Now taking you back to your years as ambassador in Kiev, it didn’t take long for the general public to become disillusioned with Victor Yuschenko's government, even though, as you said, he was a democratically elected, he was a very inspiring leader. But he simply didn’t deliver on the promises he made. How long do you think a new government that is going to be formed, within the next few months hopefully, how long does it have before people in Ukraine will take to the streets again? JH: You asked a good question as to how long the new government has. I think frankly it really depends. If there’s an immediate economic crisis we, it will not have much time at all. If Ukraine is able to receive some bridge financing to avoid a crisis, then it might have a year more. OB: Speaking about these financial issues, as you just mentioned it is estimated that Ukraine may need somewhere around $35 billion over the next two years to deal with outstanding loans and its social obligations. How much do you think this newly found Western trajectory of Ukraine is conditioned on the West's ability to deliver that money? And I would also suggest that the appetite for such generosity among the taxpayers in the United States and Europe may not be so great. JH: First of all, we really don’t know how much money Ukraine would need to get through this crisis. Now, we've heard various figures and the latest is, as you mentioned, $35 billion. I am sceptical that that much money is needed, but I don’t claim to know. More important than the amount of money are the reforms that must accompany any loan. Because if the current system continues, a current system where corruption is rife, any assistance - whether it came from the West, from the IMF, from Russia - would disappear through corrupt channels. OB: Now, you just mentioned Russia, and I know that in the early years of your diplomatic carrier you worked as a political counsellor at the American Embassy here in Moscow. And I think you probably understand how Russian officials or how Russian politicians operate. Do you think that Moscow’s concerns over Ukraine’s becoming a part of NATO, or indeed extremists coming to power in Ukraine, do you think those concerns that Moscow has at the moment - are they legitimate? And if you were a Russian diplomat, what would your stance be in that case? JH: If I were in any way responsible for Russian policy, I would like to see Ukraine develop as a democratic, market-oriented society because only, in my opinion, through transparent non-corrupt market economics can a country develop quickly. the way China has developed. OB: Well, I think this is exactly what Russia wants, at least Mr Putin made that claim on a number of occasions, that this is exactly what Russia want Ukraine to be. JH: I would say this. If Mr Putin thinks that the Eurasian Economic Union is a path to Russia's economic prosperity, he does not understand economics. The way to develop economically is to be open to the global economy. They way China has been. OB: Well that’s also true, but on the other hand the European Union is very protective of its markets, and the United States, mind you, as well. So what is so unorthodox, I should say, about Russia really trying to protect its markets, which is one of the main reasons why it wasn’t so excited about Ukraine signing that economic association agreement with European Union? JH: Russia has done very well trading with the EU. To create an economic union based on Russia, Kazakhstan, Ukraine, Tajikistan and Kyrgyzstan is not the path to economic success. It’s the path to economic stagnation. OB: Well, I think Mr Putin argued on a number of occasions that it‘s not about trading within the former Soviet republics - he also wants to make sure that Russia trades with the European Union. But I think he believes that together with Ukraine, with Belarus, with Kazakhstan, Russia, they will all have more bargaining power, but I would like to transition a little bit to the political side of things. JH: This is a bridge to nowhere. Russia’s economy has done well only because it has large amounts of gas and oil that it sells on the world's markets. If Russia created a business environment which would reward entrepreneurs who do not have a “krysha” [roof], Russia's economy would thrive the way China's economy has thrived. The Eurasian Union is protectionism. OB: Well, I think the Russian economy is doing pretty well. Let’s focus on the Ukrainian economy at the moment, or rather on the political implications of that crisis. Just the other day, I heard you say in a Bloomberg interview that: “Mr Putin believes he should be able to dictate what kind of government rules in Kiev.” And I would like to take issue with that, because I think Mr Putin was pretty comfortable cooperating with the previous pro-Western government of Mr Yuschenko and Yulia Tymoshenko. After all, it was under that government that this, very lucrative for Russia, gas deal was signed. So it seems that Mr Putin is pretty capable of building bridges with whatever government there is in Ukraine, isn’t it? JH: I think that if Mr Putin had been interesting in good relations with Mr Yushchenko and his government, he would not have conducted the gas war in the winter of 2005 and 2006. OB: But we had a similar scandal with Mr Yanukovych as well. JH: And also with Belarus, Mr Lukashenko, that’s true. Russia is only too willing to use gas as a method of imposing political pressure on a country. OB: No, but I think it also contradicts this very familiar Western claim that Yanukovych was a Russian stooge which is, really, nonsense to anyone who knows anything about Kremlin politics. Because there was absolutely no love lost between Putin and Yanukovych. JH: I don’t consider Mr Yanukovych a Russian stooge. I think that Mr Yanukovych was interested in the welfare of Mr Yanukovych. I don’t think he was a Russian stooge. And I disagree with analysts in the West who see the current problem in Ukraine as an East-West problem. The current problem in Ukraine is really a problem of an authoritarian government that has triggered substantial opposition from its own people. And the Unites States, since it believes in democracy, has endorsed the democratic aspirations of the Ukrainian people. By the way, when I was in Ukraine and Mr Yushchenko won the third election of 2004, I encouraged him to go to Moscow on his very first state visit, rather than go anywhere else. Because I understood how important Ukrainian-Russian relations are. That was true then, that’s true today. OB: Well, maybe you are in the minority when it comes to Western political analysis, because you are right that this conflict has been really portrayed in the West as this very binary, very stark choice between Russia, on one side, and the West on the other side. I wonder if it’s in a way a product of Mr Yanukovych’s own strategy, because he was the one who really tried to play Russia against the West? Has he really succeeded in that? JH: I think Mr Yanukovych tried to take advantage of differences between Russia and the West, but I also think that the political culture in Russia makes it very hard to see this as anything but an East-West issue, and that’s unfortunate. OB: Well, I think that many here in Moscow would actually say the same about the West. But since we have a just a few minutes left, I would like to ask you about Russia's national interest, and obviously Russia does have a significant interest in Ukraine - the Russian fleet is stationed in the Crimea, Russia would also be highly reluctant to see Ukraine joining NATO, and so on. I wonder if you believe that to be in the US national interest, if Russia were to lose that naval base and if Ukraine was indeed to join NATO. JH: The United States does not have an opinion as to whether Russia should have a naval base in Sevastopol. We just don’t care. It is not important. And we think that Ukraine should determine its own future. If Ukraine has a democratically elected president who treats its citizens nicely, and that democratically elected president who treats his citizens nicely says, I would like to join the Eurasian Economic Union, we would say: If that’s what you want, go for it. We think it is a mistake, but go for it. So, our issue is really democracy and the way Ukrainian government treats its own people. I think it’s actually in the interests of Ukraine to develop close economic ties with the European Union. I think it is in the interests of Ukraine and Russia to develop close economic ties together. And I think that it is in interests of Russia to develop close economic ties with the European Union. I think that a true blossoming of the Russian economy, a true blossoming of the Ukrainian economy, would be in the national interests of the United States. OB: Well it’s touching to see the American former ambassador to be so concerned with the prospering of the Russian economy, but let me ask you the final question, which is political. Again, if some of those things that I already mentioned, Ukraine becoming member of NATO, which it has been encouraged by some of the Western partners in the past. JH: It has been, that’s true. OB: If Ukraine was indeed to join NATO, if Russia was indeed to lose that naval base in Sevastopol, I think that would, sooner or later, provoke a very strong reaction from Russia, and probably that reaction would also be negative. I understand that having Ukraine under the Western umbrella is very valuable for many Western countries, it's a strategic gain, but I wonder whether it’s really worth spoiling, completely spoiling relations with Russia? JH: I don’t think that would spoil relations with Russia, because Russia needs to have a good business-like relationship with the West, including the United States. But there’s an important thing that we need to point out. You know, when I was in Ukraine, the Russian position was that they had no objection if Ukraine joined the EU. They did have an objection if Ukraine joined NATO. So the Russian position has changed and hardened in the past year or so. And that’s unfortunate. OB: Well Ambassador Herbst I have to say that no one, as of yet, has offered Ukraine EU membership, and I don’t think it’s going to happen in the conceivable future. JH: That’s true, I agree. OB: But I think we have to leave it here. I really appreciate you being on the programme, and to our viewers, please keep the conversation going on our Twitter, YouTube and Facebook pages and hope to see you again, same place, same time here on Worlds Apart.